Summary of suits and radios: Some suits are being repaired in the evening. The parts of the ones repaired yesterday evening worked well on this morning’s EVA. Summary of Hab operations: Screws tightened in the back airlock door. White tunnel covers were re-secured with new zip ties, as well as tightening loose zipties and clipping the ends of the zip ties. Summary of Green Hab operations: GreenHab door screws tightened. We woke up with the smell of fresh coffee and home-made cinnamon rolls made by our COMMS Officer (Hannah). Thanks to her and her excellent culinary skills, we are surviving in the Red Planet eating food as if we were back home on Earth (and even better I would say!). All the Crew sat down to enjoy breakfast all together as usual, but this time listening to the sound of Gloria Gaynor and her “I will survive” and David Bowie’s “Starman” from Dave’s (HSO) iPad. Full of energy, all the crew and our new Martian mascot “Gus” (found a couple of days ago on the Martian surface) started singing and dancing to the rhythm of these songs with big smiles on our faces. It was a great way to start our working day. 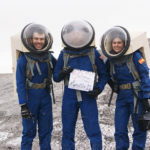 In the morning, the EVA team composed by Daniel (Commander), Veronica (ENG), Nathan (GHO), and Dave (HSO) left at 10.00 am driving Curiosity and Opportunity heading to the “Moon Area”. The team continued collecting geological samples over there, following the initial research performed a few days ago. They made further discoveries including some fossil shells and interesting igneous rocks with crystals hidden inside. Meanwhile, in the Hab, Maria (XO) supervised overall workflow and conducted sample inventory in the GreenHab and in the Science Dome. In the afternoon, we could see some clouds rising in the horizon. By 1.30 pm some snowflakes started hitting the ground. Since “Crew safety and security first” is our main motto in this mission, the team decided to cancel the EVA scheduled for the afternoon. We took the opportunity to continue working on our different projects and tidy the Hab. Nathan (GHO) spent the afternoon in the GreenHab and the Science Dome doing some regolith sample characterization, watering the plants, and taking care of the A. Thaliana -ISRUexperiment (it is truly exciting to see how some of the seeds are growing in Mars like soil!). Hannah (COMMS) worked on food inventory and other tasks while Satana’s music was playing on the background. Dave (HSO) and Natalia (MEDIA) had the chance learn more about astronomy and variable stars thanks to the explanations from Ghanim (ASTRO). 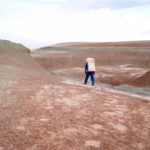 Martian mascot “Gus” is also helping us around the base. 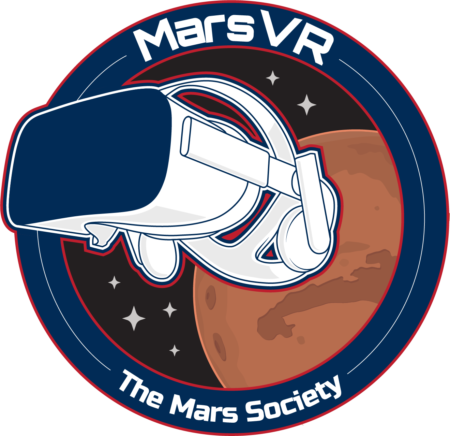 He is assisting us in putting together some outreach videos – dedicated to all of you Earthlings out there following us – about our life in here and about Mars (to be released soon… stay tuned!). This afternoon was also a time for doing some fixing around the base. Vero (ENG), Dave (HSO) tighten some loose screws here and there and together with Maria (XO) they fixed some loose sheets in the tunnels tighten all the cable ties and discovered that one bigger sheet is lose over the science dome tunnel. Our leadership team for the day – Daniel (Commander) and Maria (XO) – finished the evening working on the daily reports and planning for tomorrow. Today we completed Sol number 7. This has been an important milestone as it marks the middle of our mission. It has been one week since we started exploring these lands, adapting to this new life, overcoming daily challenges, and advancing admirably in our research projects. EVA suits now feel like a further extension of us. We have become much more efficient in our daily operations thanks to the new routine and processes that we have implemented together as a team. All the daily tasks around the base seem now to be part of our normal life. But above all, it has been one week since we became a “Martian family”. 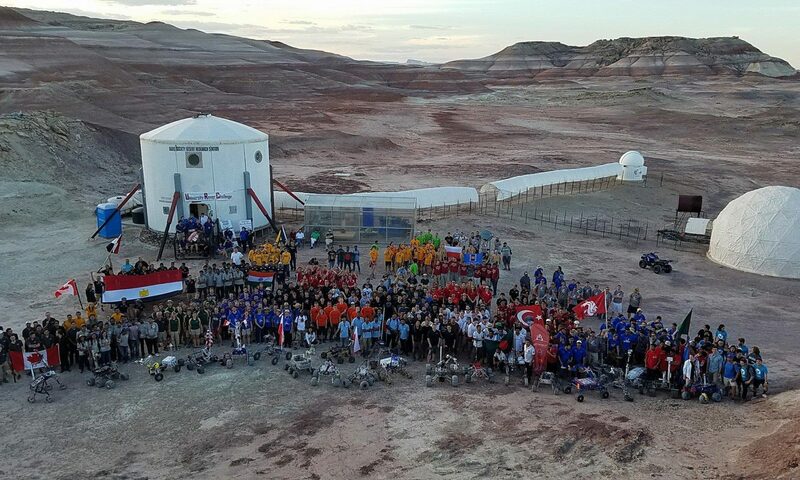 We can feel now how we have become a single unified team, driven by our shared-passion of conducting science and exploration, and supporting each other in all the steps along the way to achieve our mission goals. We have found a great balance between hard work and relax time, pushing our personal boundaries and advancing in our mission objectives. We have passed already one week here and we cannot wait to see what excitements the next days will bring! Objects Viewed: Last night 10 images were captured out of the requested 18 images for MDRS Target 1. The quality of the images is bad and one of the images looks shaky. Crew astronomer suggested to resubmit the observation and Observatory Director recommended the same due to some problems encountered, thus the observation was resubmitted. New photometry measurement was performed for SY MON target. Based on the previous experience gained, the new measurement was found to be 14.132 with an error of 0.0185. The data point was submitted to the AAVSO website with the star 122 as a check star. Problems Encountered: Mount Problems which caused shaky images. The moon was also bright, so bad images were captured. Observatory Director solved the problem. Changes to crops: Radish plant is flowering. Narrative: The Arabidopsis thaliana experiments died overnight despite ample watering due to dehydration. Consequently, the experiments were restarted this afternoon (see Science Report). Miracle Grow nutrient supplement was sprayed sparingly on sugar snap peas, tomatoes, mustard, and cucumbers. Dead biomass on the sugar snap peas was pruned in order to help improve the productivity and health of the plants. The dead biomass weight will be used in our cellulosic ethanol ISRU project. The door was opened at 1515 hours to allow for ambient airflow but closed at 1545 because of the snow storm and drop in temperature. 4.2 g of Mixed Salad Greens were harvested as a garnish for dinner. One of the radish plants is flowering which may be cause for concern (angiosperms often flower when stressed). We will investigate when the radishes were planted in the logbook to determine whether this is part of the natural lifecycle or actually a stressed organism. The GreenHab inventory and inventory of plants currently growing at the facility was completed today by the GreenHab officer and today’s XO. These will be made available for future crews and updated by crews during their rotation. 1.) ISRU Study: Continued characterization of the regolith samples have produced interesting properties. The pH of most of the samples have yielded a pH that is neutral or slightly alkaline with the exception of one, which is slightly acidic. These values suggest that the substrates may be good candidates for plant growth and retaining nutrients. Higher pH substrates cause the Hoagland’s #2 hydroponic nutrient supplement to precipitate out. 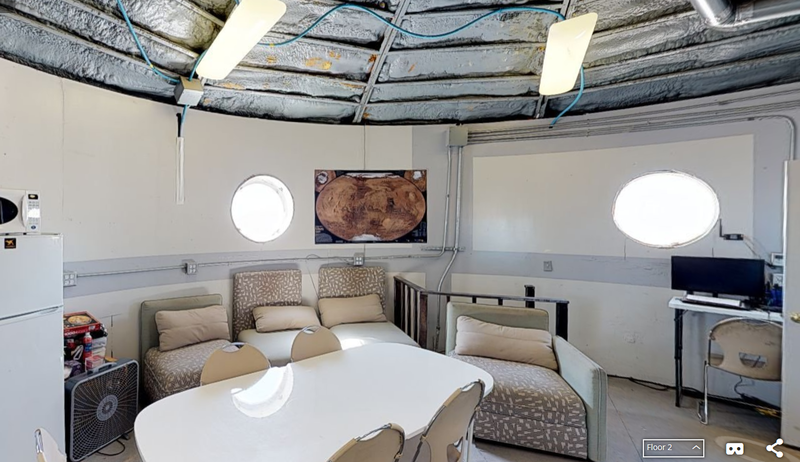 The probes in the Science Dome to investigate conductivity and redox potential are not operational, so this property will not be investigated until returning to Florida Tech. 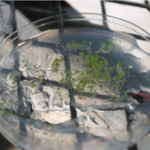 Using an agar media plug, germinated Arabidopsis thaliana seeds were transferred from the agar germination plate into regolith samples. However, the regolith is exhibiting interesting wettability properties, largely drying out within several hours despite ample watering, effectively killing the fragile Arabidopsis seedlings quickly overnight. The Arabidopsis seeds were planted again this afternoon, with more plants per sample and care to arrange the regolith around the plug to prevent quick dehydration. Dead plant material from the GreenHab was taken and dried using an oven in the Science Dome and subsequently weighed for the cellulosic ethanol ISRU study. 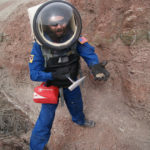 We will begin a study soon mixing the regolith samples with potting soil to try to improve the success of this study. See attached pictures to see experimental design. 2.) GreenHab: The inventory of equipment in the Science Dome and GreenHab as well as the plants currently growing is nearing completion and we have begun a list of the seed bank. We suggest these lists to be available to crews prior to rotation and checked and updated while at MDRS. This will improve the ability of crews to design experiments and mission plans effectively and improve the efficacy and safety of all participants involved. Additionally, the sugar snap peas appear to be stagnating, so a nutrient supplementation solution (Miracle Grow) was diluted using the industry standard and applied to the base of the peas along with a few other species sparingly. 3.) EVA Project: The success of an extravehicular activity (EVA) depends highly on both the EVA crew and CapCom crew being aware of the planned objectives and the intended route. This means that both parties should conduct the planning of the EVA together, in order to understand what is to be accomplished and what hazards could change the EVA’s outcome. Crew and CapCom should also be in contact during the EVA for both safety and additional information on EVA progress. The following post-EVA checklist will allow crews of planetary exploration analog sites going on EVAs to expose deficiencies in both the planning and execution of the EVA. This process allows planners and team members to improve their process of preparing for an EVA. This will lead to more effective and safe EVAs. 5.) Astronomy: One week has passed since the start of crew 205 rotation. Two observations were submitted, but the weather prohibited the completion of one observation. The target observed was SY MON, while we called the other target MDRS Target 1. 4 photometry measurements were performed for SY MON as per the below table. The Magnitude Value of 14.132 was submitted for the AAVSO website. 14.147 93 111 122 134 148 No Check Stars were used 0.01568 This measurement was repeated because of no check star was used, CCD setting was wrong and there are better ways to select comp stars. 14.118 140 143 132 No check star because this is manual calculation It was found that Comp 97 positioned outside the straight line of the curve, thus it was decided to exclude it. Narrative: Warned about the potential for snow the previous night, the crew decided to cautiously undertake the EVA and continue monitor the weather system forming on the Southern Mountain to determine whether cancelling the EVA mid-way through would be necessary. The team began pre-EVA preparations at 0925 hrs, and entered the airlock for depressurization at 1006 hrs. 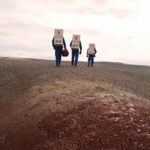 The team of 4 headed North from the Hab along Cow Dung Road on the rovers Curiosity and Opportunity. They remained on this road for a while heading towards to Moon, losing contact with the Hab at 1011 near Galileo Road as expected. As they crossed Tank Wash it was noted Opportunity’s SOC was around 72% and Curiosity’s only a few % higher. The team turned West onto Brahe Highway and drove across the Moon Region, until they decided to stop a few hundred meters short of the Copernicus Highway turn off, due to Opportunity having 62% SOC remaining. 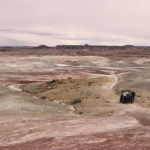 From here, the crew walked West along the road a bit more, but after finding a suitable location to explore from the road, turned NNE and headed into the Grey Moon area. 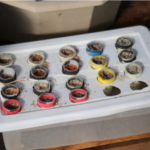 Here they obtained a couple of samples from the grey material and dried riverbeds. Following river channels, they headed East, and encountered a reddish area near the joining of a few stream beds. It was here they obtained several samples including what were very clearly fossilised shells of ancient snails and limpets. A very exciting find. 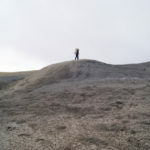 They summited the hill by the red stream bed and spotted an interesting crevice where a larger stream used to flow. Following this for a few hundred metres they encountered other interesting sample sites that included what in the wet season would be a small waterfall as part of the wash at the crevice’s end which made for some good samples and photos. Spotting that Skyline Ridge and the peaks to the North West of them were becoming clouded, the team decided to return to the rovers by following the crevice back and then immediately turning back towards the road. They briefly stopped for some photos in-front of a grey lunar hill, in preparation for outreach events to celebrate 50 years since the Apollo 11 landings later this year. The crew returned to the rovers by 1200 and headed back towards Cow Dung Road along Brahe Highway. They briefly stopped again to GPS mark an interesting stratified ridge line to explore at a later date, and near Tank Wash to observe a proposed route to walk from that area to Murphy’s Canyon. The crew had returned to the Hab by 1240, and in the nick of time too, as within half an hour snow flurries had begun outside the Hab window, which has led to the second EVA of the day being cancelled. Roads and routes per MDRS Map: Driving North on Cow Dung Road (1572), turning West onto Brahe Highway (1575), and then walking around Grey Moon area. 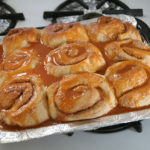 Sol activity summary: This morning began in spectacular fashion thanks to the heroic efforts of Hannah, our crew’s Communication Officer, who woke up early to make us all cinnamon buns to start the day right. The morning’s EVA team was geared up for their expedition in good time and left only a few minutes later than scheduled. They drove Opportunity and Curiosity to within a few hundred metres of Copernicus Highway in the Moon Region before pulling over. The rest of their EVA was accomplished on foot in the Grey Moon area, and succeeded in bringing back samples from 9 different sites – including the fossilised shells’ of ancient sea creatures! The EVA team were monitoring the weather and as they noticed heavy clouds approaching (likely with snow) from the southern mountain and skyline ridge, they decided to return to Hab. The reunited crew enjoyed a tasty soup of cheese and broccoli with added chicken for lunch. Not long after we finished, the crew noticed snow flurries beginning from the Hab’s windows. After 10 minutes or so they hadn’t stopped and so the decision was taken to cancel the afternoon’s EVA. Even after the snow eventually stopped, from the looks of the clouds surrounding our little oasis, we all agreed it was probably safer to have stayed and worked in the base itself. 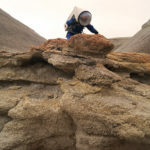 Look ahead plan: If the weather outside tomorrow is safe, the crew intends to conduct an EVA, deep into Condor Chasma to retrieve samples from the harder to reach areas. The team for this will be mostly made up from those that didn’t get the chance to do an EVA this afternoon. This is provided the snow holds off overnight too. Now that the Journalist (Maria) has compiled all the crew interview videos she is hoping to start editing together our Crew Video, but for today and tomorrow it is her turn to be XO and CO. As always, science will continue in earnest at the base. Many samples from today and likely tomorrow morning are still to be analysed and catalogued fully, and also the final few Arabidopsis seedlings have been transferred to be grown in regolith substrate as part of our botanical ISRU experiment.